Hey guys. No, I'm not dead. I was just…vacationing. Plus the fact that I'm a lousy updater. But anyway, if you'd like, I will do a review of the AG summer release(with the dolls). If you have an idea for a post, please comment. Hello! The girls(Kanani, Maddie, Kit, and Amelia Pru) are off doing homework so I'm doing this post for them. 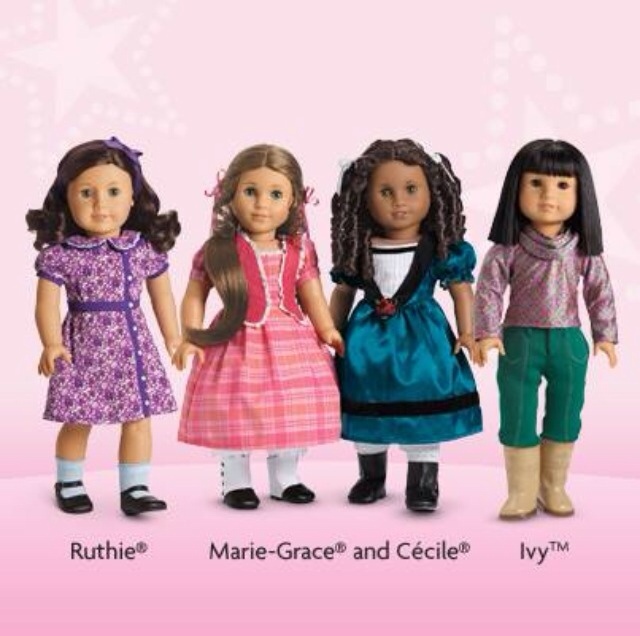 So American Girl announced this week that they were retiring 4 dolls:Ruthie, Cecile, Marie-Grace, and Ivy. 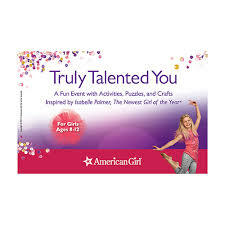 Unfortunately, this cuts down the possibility of Nellie returning as American Girl is retiring the Best Friend Dolls. What do you think about this? 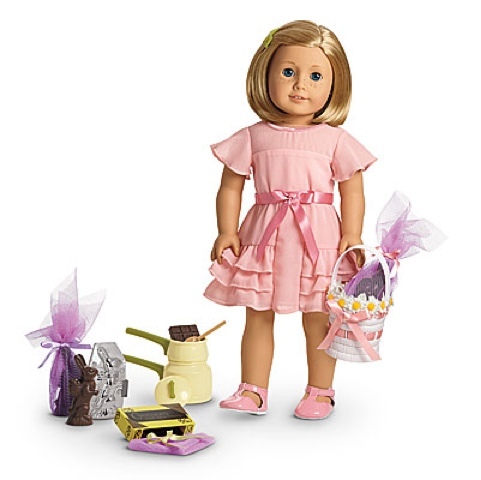 Do you think that American Girl is planning new doll releases or unretirings? Hi guys! Well, today, we have our first guest post! Yayy! There will be a post afterwards so look out for that too! Noor, take it away! Well hello, my name is Alisha and I'm 8 years old (in doll years) Anyways, I'm so excited to do this post! Yay! Like my Human(Noor) said, I am going to be showing you around my room today. It is small but I love it!!! Ready? Let's go!! Here is a picture Human took of me! (She's not the best photographer.... we had to enhance it.) ALISHA! You were not supposed to say that. Sorry.... Well, don't I look awesome. Those boots are my favorite!! Next up is my desk. (Another bad picture from human.) HEY! It's true. So here is my somewhat pretty desk made from a shoebox. On it I have a pretty cover thing that my friend Julie gave me. 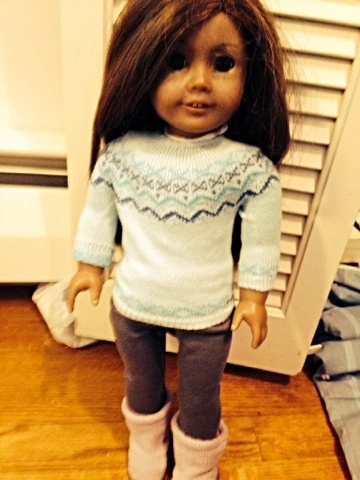 (Noor here, Julie is my friend's doll.) On the cover, I have a hair-tie, a brush from AG, and a lotion thing. I also have a giant bag full of bathroom stuff. This is stuff inside of my desk. First I have a little bin full of coloring/drawing tools. Next to that I have my mini-perfume. 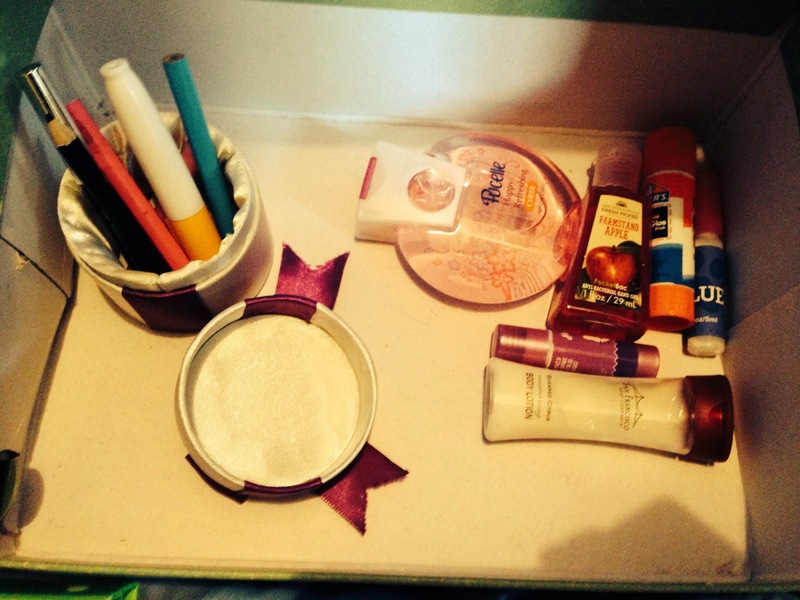 Next to the perfume, there is a hand santizer, two glues, a lip balm, and a lotion. The lotion is really helpful for my dry skin! Over here is my shoe pile. 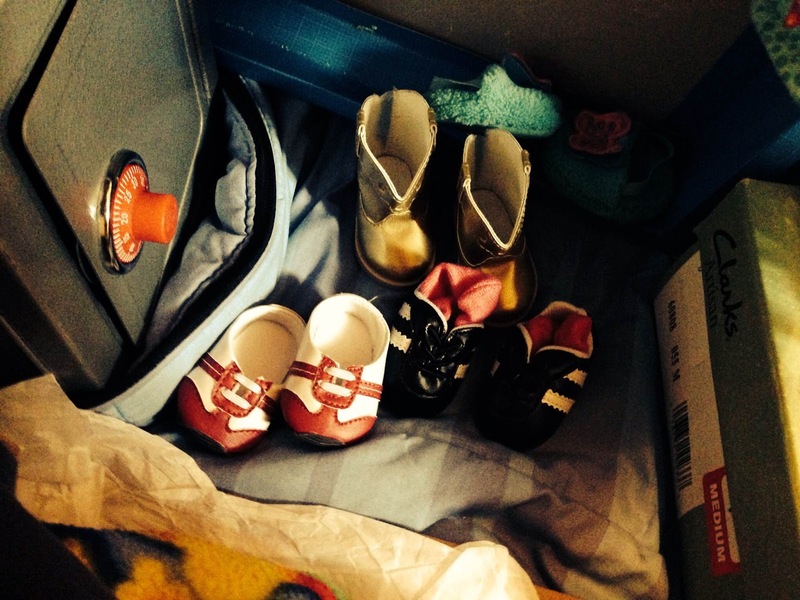 We have my sneakers, soccer cleates, cowboy boots, and slippers. It's really easy to get my shoes after I come out of bed. Well, here is her room. I hoped you liked our tour. 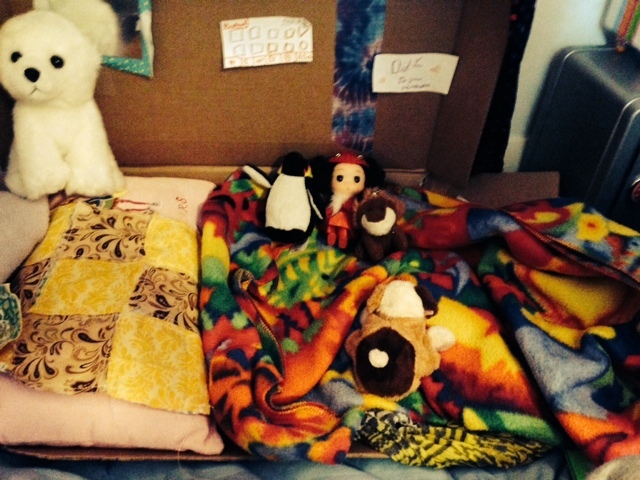 Tell us in the comments below if you would like to know how to do some of these crafts like maybe the bed. I would love to do another Guest Post on this blog teaching you AG lovers how to do that! Hey guys! Happy Easter! Chocolate bunnies and stuff is EVERYWHERE. Even in American Girl's special edition set for me. CoughcoughHumangetitformecoughcough. We need to get some Reece's Eggs or the Reece's bunny. REECE's HAS CHOCOLATE BUNNIES?? Yup. I bet it tastes really good. Hey! Why didn't you guys wait for me? AHH! Oh, hai Kanani. Um... you were busy? Whatever. Continue on. Uh, ok. How was your Easter? Comment below! Seriously? Hi guys! I'm technically supposed to wait for my other sisters to announce the winner, but I wanted to do it. Plus, they are late (and busy). KAYLA! CONGRATULATIONS!!! We already sent the email and your poster will be coming sooon! We will be having more giveaways and posts, so check in often! HI HI HI! Hey! What's up? Hello everybody! I bet you are wondering, what happened to the giveaway we promised? It's here! Have any of you guys went to the events at Barnes and Noble? Well, Human went, and she got some Isabelle stuff for one of you guys! No, not the actual doll. I wish. But, we have something just as good! Sort of. We are giving away this poster and the journal that they had at the Truly Talented You event! I really like it! Me too. I hope you like the prize. Just enter above! It ends the 29, so enter before then! Hey guys! I know I have been posting a lot, but this kind of stuff is what I do. Hey. Ahh! First Kit, now you? I can just sit here. Is that ok? I guess. It's a free country. Alright. 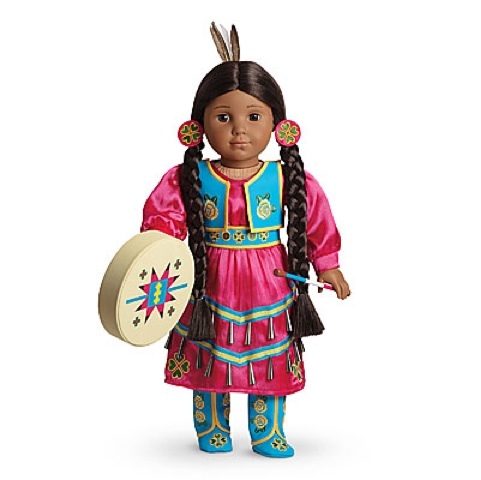 Well, American Girl announced on their Facebook and Twitter that Samantha will be returning! Awesome! Yeah. Well, Human really likes her friend, Nellie. 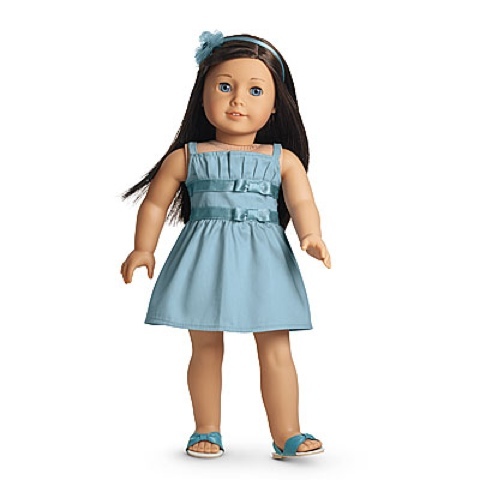 American Girl didn't announce the return of Nellie, though. I think she might return as well, because she is pretty much a part of Sam's collection. Oh, and AG also said something about changing the Historical Line. I wonder how. Well, that looks like that is it for today, so I will see you guys later! Bye! P.S. 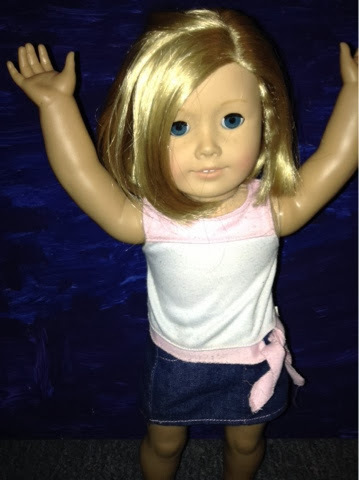 Do you like the other dolls kind of barging in on my posts? I am kind of fine with it and almost like a guest appearance. Oh! Speaking of that, if you want to make a guest appearance, email us dolls at dollsondablog@gmail.com. Hey guys! Sorry for the delay on stuff, but now I'm here! Sooo, AG released a bunch of items today. And I am going to report on them! Well, some of them. Well here are my picks! I really like this outfit. It's nice and bright. I bet Mini Kaya would want this outfit. :) also, Kaya really deserves more outfit. I would probably wear this outfit or get this for Kit. It's nice and kind of frilly but doesn't serve Kit's personality at all. It could be a nice Sunday outfit or something. Oh, and the chocolate bunnies! Yum! Ummmmm ok? 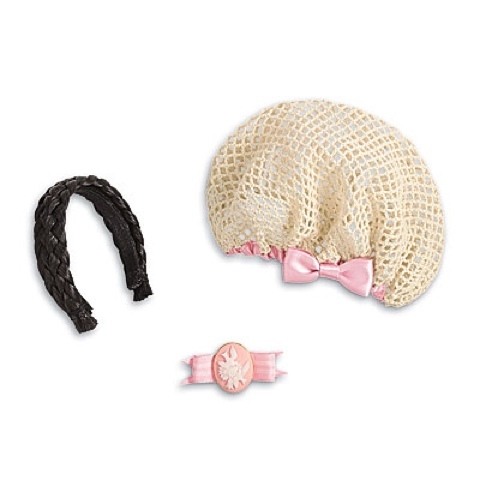 I suppose it is cool as accessories for Addy but ummmm I have nothing to say about this. Nice I guess? This is absolutely beautiful! Totally me. I give this a 10. You didn't rate anything else. Ahhh! How long have you been sitting here? The whole time. Ummmmm ok? So I really like the double bows on the dress and the color. Me too. We'll see you! Yeah! Go Team USA! Hey guys! Sorry for not posting. I had a lot of school to deal with. Don't worry, the giveaway will start this weekend! I hope. :) Well, you will see some USA spirit from the dolls as the Olympics go on. Did you guys watch the opening? Reply below! Late right now, but late in the day than never! Umm, ok? Soooo we will update our header as soon as possible(thanks to Rosey Red Designs)with all four of us. This deserves a brand new group photo. Ok, but we need to tell everybody about the Blogoversary giveaway! It's nothing big, but made by Human for one of you guys! Speaking of that, our etsy shop will open pretty soon, so look forward to that! Hello guys! Well, it's almost been a year since I've started my blog. ONE year! I've started this blog with 2 dolls and now there are 4(the twins and Marie-Grace will maybe post soon and occasionally) . 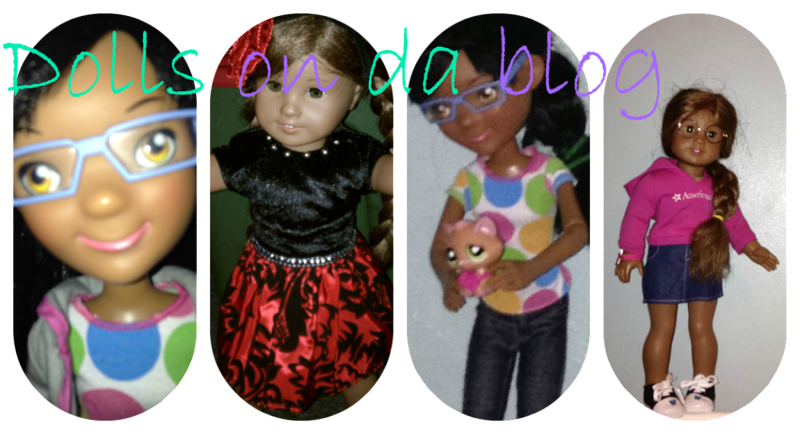 If you want to do a guest post with us, just email us as dollsondablog@gmail.com! Well, the dolls will celebrate later this month (maybe the day of) and we will hopefully do a giveaway. Please comment below what you want us to do for our Blogoversary! Happy New Year! And the Dolls' thoughts about Isabelle Palmer! Hi! Hi! HELLO YELLO! Hey! Umm... Kit is a little... hyper today. HAPPY NEW YEAAARRRR!!! WOOT WOOT1! So Happy New Year! Isabelle is here! BOOHYAH!We're going to have Kit stay off the computer.Yup. We checked out the Whoa whoa whoa! You forgot to tell them about the awesome New Year's Eve Party we had! I would but SOMEONE didn't wake me up when the Ball dropped.We did! You kicked my face. I did? Yup. So we saw the ball drop without you. Seriously?? So we checked out the Ag website and saw Isabelle Palmer! Blanche Palmer sounds much better. Yea, it does. But we saw the contest and got Human to enter! So we can fly to New York and be in a cool hotel and go the American Girl Place and stuff. And to get Isabelle. Isabelle has a lot of clothes. She really does. 20 Mix and Match outfits combinations? I wish I had that many. And her cat is named Tutu. Tutu? BAHAHA! But I kind of like the name. And I like her pink hair. Wait wait wait! Did Kit stay up for the countdown? Take a wild guess. She erm.... found my secret candy stash. And ate it all. Oh. So she did. Uh huh. And it's why she's still hyper. ORIWEDBOFA1! Well, see you guys later! KIT! Bye! Which caption is the funniest? Catch up with my posts by Email! Which Girl Of The Year do you like? Grab My Button! If you want to swap, please comment! Blog design by Grace. Simple theme. Powered by Blogger.